A man walks past an electronic stock quotation board outside a brokerage in Tokyo, Japan. TOKYO - Asian shares were a tad firmer on Thursday, taking their cues from strong U.S. data although holiday-thinned trade and uncertainty about the impact of recent hurricanes on the U.S. economy are likely to keep investors cautious. MSCI's broadest index of Asia-Pacific shares outside Japan .MIAPJ0000PUS was almost flat while Japan's Nikkei ticked up 0.1 percent. In Asia on Thursday, trade is expected to remain subdued with China, Hong Kong and South Korea closed for public holidays and analysts cautioning against reading too much into index moves. Wall Street’s three major stock indexes rallied to fresh highs on Wednesday as did MSCI’s all-country world stock index .MIWD00000PUS. The Institute for Supply Management’s index of non-manufacturing activity rose to 59.8 in September, its highest reading since August 2005, pointing to the resilience of the vast U.S. services sector despite disruption from two powerful hurricanes. However, data from private payrolls processor ADP showed monthly hiring slowed to an 11-month low of 135,000 although this was better than economists’ median forecast. “Shares markets were supported as economic data was generally strong,” said Masahiro Ichikawa, senior strategist at Sumitomo Mitsui Asset Management. Economists expect Friday’s nonfarm payroll report, one of the most closely watched pieces of economic data in financial markets, to show a similar slowdown. They estimate a payroll increase in September of 90,000, substantially lower than the average over the past year of around 175,000, though some say investors may need to pay attention to state data due on Oct. 20 to exclude the impact from hurricanes. The data also helped to lift bond yields off lows, though the market remained in well-worn ranges. “Because U.S. economic data for August to October is likely to be disrupted by hurricanes, markets may show a much smaller response to them,” said Tomoaki Shishido, fixed income analyst at Nomura Securities. “In that regard, the market will be focusing more on policy issues, such as tax cuts and the choice of the next Fed chair,” he added. High-rated bonds were helped also in part by worries about Catalonia’s independence vote from Spain. The country's IBEX stock index posted its worst single-day loss in 15 months with a 2.85 percent decline on Wednesday. Catalonia will move to declare independence from Spain on Monday while Spanish Prime Minister Mariano Rajoy’s government called on Catalonia to “return to the path of law” first before any negotiations. In currency markets, the euro traded little changed at $1.1761, off Tuesday's 1-1/2-month low of $1.16955. The dollar stood at 112.77 yen, capped below last week's high of 113.26. Oil slipped after a surprising jump in U.S. crude exports to a record 2 million barrels per day fanned worries about global oversupply. Brent crude futures LCOc1 hit a two-week low of $55.38 per barrel on Wednesday and last stood at $55.75. U.S. crude WTI futures CLc1 also hit two-week low of $49.76 per barrel and last traded at $49.90. 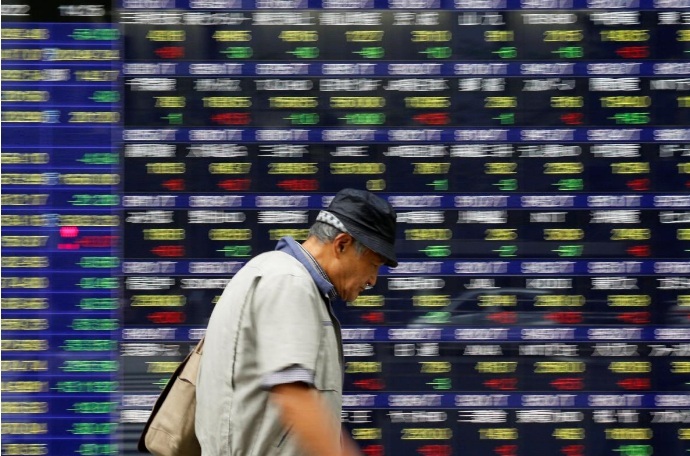 Asian shares were a tad firmer on Thursday, taking their cues from strong U.S. data although holiday-thinned trade and uncertainty about the impact of recent hurricanes on the U.S. economy are likely to keep investors cautious.